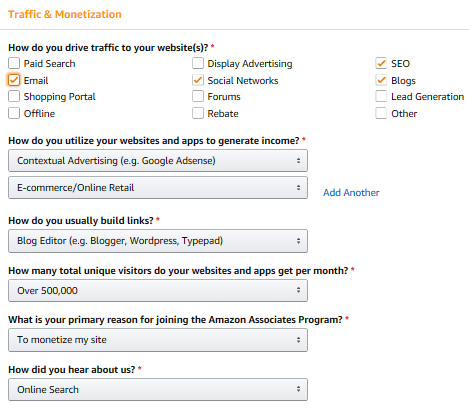 The Amazon Associates program is one of the best monetization methods for your blog. I personally know a number of websites on Amazon niche which earn a decent income by promoting e-commerce products, deals and displaying ads. It is free, reliable and used by nearly one million web publishers around the world. Are you ready to become an Amazon affiliate and make money via referrals? If yes, sign up here to create an Amazon affiliate account. Tap Join Now button. Enter your credentials or if you are not an Amazon.com customer, create a new account. Once the account is created, you will get a signup page to create an affiliate account. Enter your name, address and a working phone number where you will get a call for verification. Tap Next to save details and go to the next page. In the new page, enter your website address or app URL where you are going to promote Amazon products. You can add up to 50 website websites or mobile apps one by one. Inform whether any of your websites or apps directed at children under 13. Such websites are not eligible to display ads, links from Amazon associates. If there are no such sites or apps, choose No option and hit Confirm button. In the third page, you should fill the profile with the preferred store ID, Amazon items that you are going to promote, websites/mobile apps type and traffic generation methods. Tap Next again and confirm your mobile number to get the verification call. Don’t forget to set your country code before initiating the call request. A four digit pin will be displayed on the screen that you need to enter on the phone during the call. On the successful verification, put a tick mark under Operating Agreement section and click Finish. 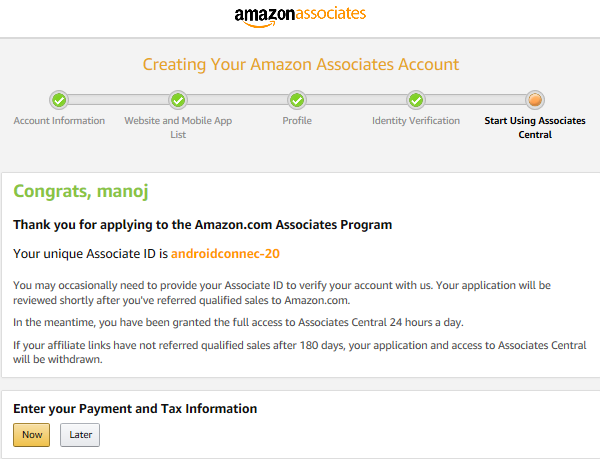 Amazon will review your application and let you know about the status through email. Once it’s approved, you need to set the payment mode and tax-related information. The company pays affiliates in three modes- Pay by Amazon.com gift card ($10 threshold), Pay by direct deposit (US associates only, $10 threshold) and Pay by check ($100 threshold, $15 processing fee applies). Finally, type your tax information to get the payment from Amazon. It includes your status, citizenship, payment address etc.